In Vietnam, the young generations and the industry of traditional arts and crafts have been facing many challenges. To preserve and represent traditional Vietnamese arts and crafts and its innovative applications, support and raise awareness of the community, engage and educate the young generation through the production process and encourage local designers, artists to contribute to the improvement of the industry. The petal structure is a way of organizing multiple speakers or stories around one central concept. It’s useful if you have several unconnected stories you want to tell or things you want to reveal – that all relate back to a single message. You tell your stories one by one before returning back to the centre. The petals can overlap as one story introduces the next but each should be a complete narrative in itself. In doing so, you can weave a rich tapestry of evidence around your central theory, or strong emotional impressions around your idea. Saigon Chuyen is a storyteller who is constantly in the process of taking ancient images and casting them into contemporary kinds of forms. Its purpose is to take the audience on a journey, leaving them feeling inspired and motivated. 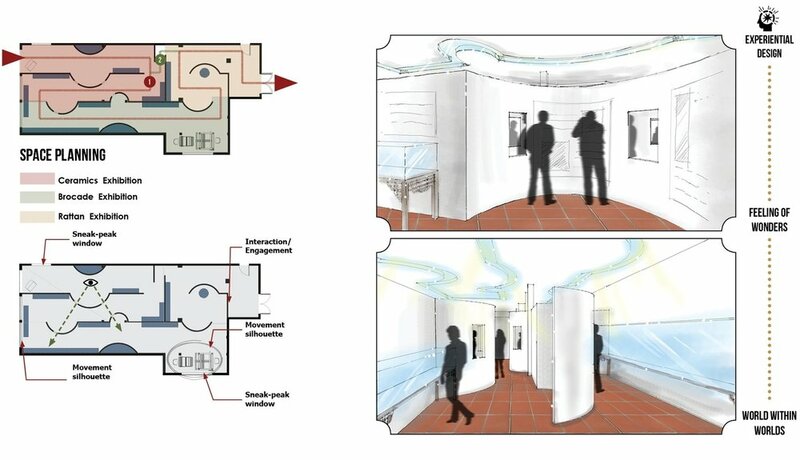 The space is divided into four main areas that allow the visitors to journey through the four stages of storytelling: Exposition, Rising Action, Climax and Resolution. 1. EXPOSITION (Workshops): Visitors are introduced to Vietnamese traditional arts and crafts by observing the artisans in their working environment, as well as in the production process. Here, they also have the opportunity to sign up for various workshops (Ceramics, Rattan, and Brocade Weaving) to learn the craftsmanship in depth. 2. RISING ACTION (Exhibition): Visitors are exposed to the history, current trends and potential applications of the crafts. The exhibition also provides an interactive activity: the hand-on weaving loom located next to the "sneak-peek" windows*. The item produced by the activity symbolizes the collaboration of everyone to promote the crafts. *"sneak-peek" windows are the three points of attraction that visitors encounter before entering the reception area. 4. RESOLUTION (Cafe/Restaurant): The space provides a relaxing environment to encourage discussion among visitors. 3. CLIMAX (Retail Store): After building up understanding about the value of the crafts, visitors get to express their appreciation and preserving the memory of the experience by collecting souvenirs. The main entrance starts with a ramp leading to the outdoor walk-way to the Reception. As the body tends to look down while going up, a quote which captures the main experience of the center is strategically displayed on the ramp. POINTS OF ATTRACTION placed throughout the walk-way (sneak-peek into the Restaurant, and the Exhibition where the interactive activity is, as well as access to the Retail) give visitors glimpses of the experience, as well as bring out curiosity, excitement and encouragement to discover the space. As visitors journey through the space, their knowledge about Vietnamese traditional arts and crafts are not only improved by the activities but also by the architectural and interior elements. The design themes of consecutive spaces transform from the traditional Vietnamese architectural style to the more French influenced design at the end. This represents the evolution of Indochine styles throughout different periods of Vietnam's history. Thus, visitors would leave the center enriched in understanding and appreciation towards the crafts. Inspired by Sonsbeek Pavilion in Arnhem, a temporary pavilion designed by Aldo Van Eyck, the Exhibition aims to provide the same "feeling of wonders" experience. The floor material is terra-cotta which was widely used for outdoor in traditional Vietnamese gardens and courtyards. Bringing it to the indoor space along with the low walls and sudden cuts creates a sense of "world within world".